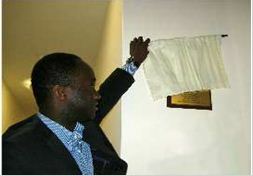 MP for East Surrey, Sam Gyimah, visited the College on 20th May to open formally the refurbished care rooms. 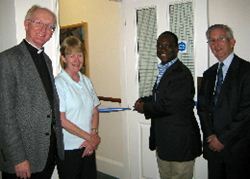 After coffee, Mr Gyimah formally opened the newly appointed rooms, cutting a ceremonial ribbon at the entrance to this part of the College.Mr Gyimah enjoyed lunch and spent time meeting Residents over coffee. 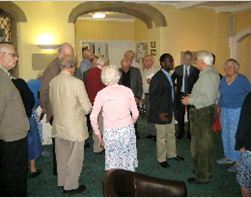 He was clearly impressed by the wide diversity of ministries with which Residents have been involved. “The College is full of fascinating people who have accomplished remarkable things,” he said. He went on to unveil a commemorative plaque and toured the College, learning more about its history, seeing and the restoration work in the historic chapel. Project which was completed earlier this year (to read more, click here). Thanks to the generosity of the many donors who were inspired by the Archbishop of Canterbury’s appeal, and the support of trusts and other sources, Phase 1 of the College Development Project is complete. 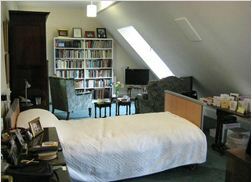 Four Residential Care rooms have been beautifully refurbished and now provide the highest levels of comfort. The contractors were asked to have the project ready to hand over on 1st February and the first Resident moved into one of the rooms of 31st January! Existing windows have been double glazed, three new windows have been installed and massive amounts of insulation have been incorporated into the ceilings. There is even a facility to draw hot air out of the en suite bathrooms, dry it and deodorise it, and then re-circulate it to keep the corridors warm. There has been as much care lavished on the exterior. 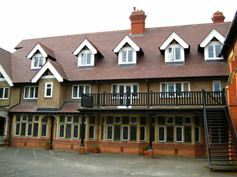 The oldest part of the Central Block has a new roof which, as well as being sound again, looks as good as it must have done when this part of the College was first built in 1900. At the same time, the chance was taken to complete the other high level repairs that were needed.